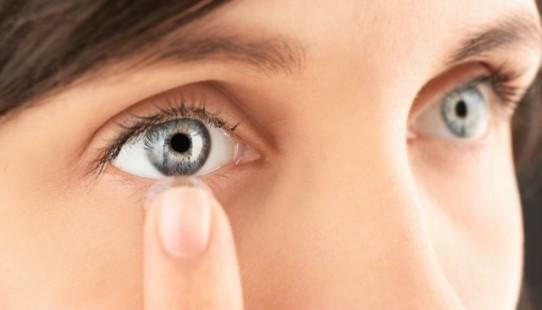 Contact lenses are thin lenses worn directly against the eyes to correct vision problems such as myopia or astigmatism. Many people choose contacts over eyeglasses because of fashion or practical needs (glasses can come off or interfere with safety devices, for example). You may need a specific type of contact lenses known as Toric contacts if you have astigmatism. An optometrist in Bixby and Okmulgee at The Eye Center will be able to assist you with all of your contact needs! Toric contacts are a type of soft lens designed specifically to help treat astigmatism. Most of these contact lenses are made either from a traditional hydrogel or a mix of hydrogel and silicone that allows the lens to remain soft and breathable. However, a few Toric contact lenses are made from a rigid gas permeable material, instead. An eye exam will determine what type of contact you need. Toric contact lenses differ from regular contact lenses. A typical contact lens, also known as a "spherical" lens, can be worn in any direction. They have the same power across all meridians. However, Toric contact lenses have different powers in different meridians, so there is only one correct way to wear them. Fortunately, Toric lenses will orient themselves to the correct directions, which means you'll always be able to see clearly when wearing them. You may be a candidate for Toric contacts if you have astigmatism, a condition in which light focuses at multiple points in the eye rather than just one, and prefer contacts over glasses. Your Bixby and Okmulgee eye doctor can advise whether Toric lenses are ideal for your needs after an eye exam. Beware that it typically costs more to be fitted for Toric lenses than traditional contacts because the exam requires greater expertise. Furthermore, the complex design of Toric contact lenses means they cost more than traditional soft contacts. You may also have to try several brands before finding the correct size. The Eye Center provides exams and lens fittings. So if you are looking for an optometrist in Bixby and Okmulgee, give us a call at (918) 756-0316 for an appointment or more information.